Lal Quila or the Red Fort was the official residence of the Mughal Emperor Shah Jahan built about 200 years ago in 1628. For me, the whole experience of visiting Red Fort was like peeling off an onion. The more you move into the inner realms of the fort, the more beautiful and whiter the buildings and structures would get. Finally, it came to the one building that I admired the most in the whole complex and Amir Khusraw had most aptly described it as the paradise on earth. His inscription is written on the walls of this white marble structure- If there be a paradise on the earth, it is this, it is this, it is this – Diwan-e-khas! I am still wondering what resplendent, what exciting and what colourful life it would have been then. 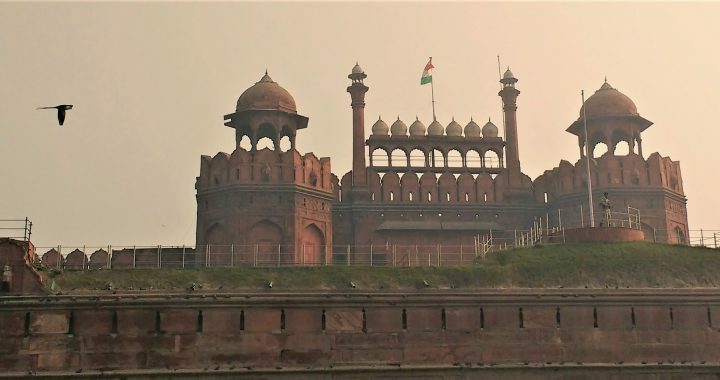 The boundary of the Fort and some of its buildings are built with red sandstone and the name Lal Quila or Red Fort comes from there. It is a well built, massive structure that encircles and secures the entire surrounding of the complex – the official palaces, mahals, gardens and the many other small and little buildings it ensconces. There were trenches and channels of water all around to give the added security to the fort. The gates are massive and built to protect the citizens inside the walled city. The walls are built with holes in it for firing arms and ammunitions. The four posts at the four corners were used for keeping a vigil. The front façade is used right now during the Independence Day celebrations by the Prime Minister to address the nation. However, the fort is just much much more than the front façade! There is another huge and massive gate as soon as you enter from the front with a metal door called Lahori Gate. 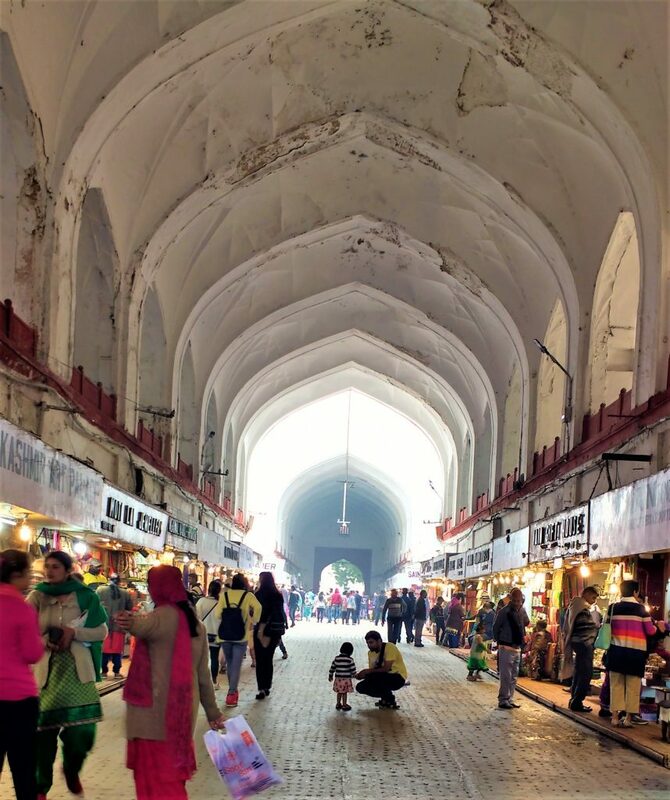 This leads to a long covered path with arches and arched bays on both sides – more like a market place where you have shops on both the sides of the road. It is called the chatta chowk which means covered bazaar. Even today there are shops where people are selling all kinds of wares – jewellery, clothes, handicraft items. It was said that this used to be the case even during Shah Jahan’s time. He started this concept after he saw something like this in Peshawar. During his times, the market would be engaged in luxury trade of the imperial household and used to sell silks, brocades, gold, velvet and other expensive stuff. After the Chatta Bazaar, there is yet another gate which takes you to a red building – the Diwan-e-Aam which means the ‘Place of Public Audience’. There is a long rectangular lawn with a water body in the middle that runs across to the Diwan-Aam and paths cutout on both the sides. This is a place was used by Shah Jahan to meet the common public and hear their grievances. The structure was made in red sandstone and in the centre is a raised platform with the Emperor’s throne with a canopy all made in Marble with exquisite handiwork of floral designs inlaid with semi precious stones. After the Diwan-e-aam lies the little gems of beauty – domains where Shah Jahan and other successive emperors used to actually live and spend time. You would be greeted with an expanse of garden and green lawns and water canals with white marble structures spread across the expanse. The water bodies at that time was an important part as they provided the needed water and air cooling for the entire place. Three white marbled palaces are placed in close proximity to each other at the other end of the garden – The Rang Mahal (also called Shish Mahal), Khas Mahal and Shah Mahal (or Diwan-e-Khas). These were like 3 little pieces of jewels in that whole area. Built completely in marble, they are a sight to behold! Rang Mahal was the place where Shah Jahan used to entertain and be entertained. It was painted in different colours from the inside and therefore derives its name from there. It also had mirrors fitted on the top and therefore it was called the sheesh mahal though right now there is neither colour nor the mirrors. This one actually looks faded and is the drabbest one out of the three. 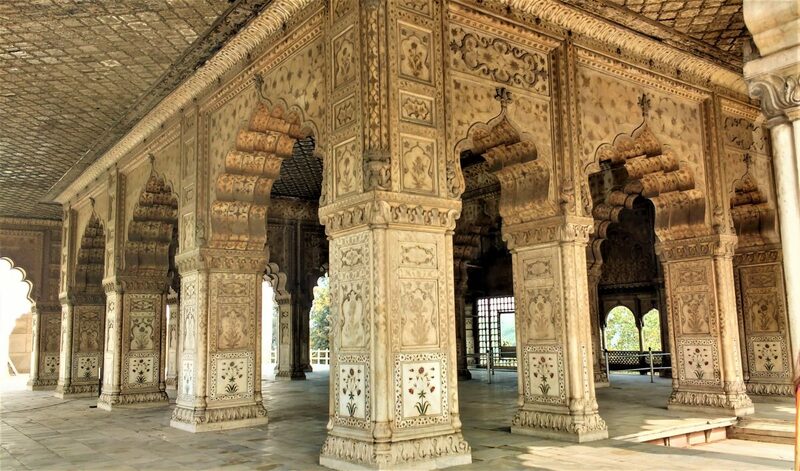 The next one is the Khas Mahal where Shah Jahan had his bed chambers and the dressing room. Diwan-e-Khas next to it was the place where he would meet people close to him. This palace was truly amazing in its architecture and the structure. Though faded and greyish and yellow in colour, the structure speaks of the glorious past. The peacock throne was removed from this place by Nadir Shah who attacked Delhi and it is said that this throne is somewhere in Iran right now. The opulence and the extravaganza was clearly visible in the luxurious setting of the entire structure. The richness of the designs and the work on the structure was truly marvelous. I was wondering if these structures look so good even today after the wear and tear of the last 200 years, then what would it have been when it was pristine white colour of the marble resplendent with all the other colours the buildings would have been painted with, the coloured drapes, the carpets and all the precious stones that were embedded in the building design. It would have been truly mesmerizing and therefore What Amir Khusraw said about this building would have been completely true at that point of time. It would have been a paradise to behold! It is said that Taj Mahal was inspired by the Diwan-e-khas and its architectural designs. There are other buildings too like the Mumtaz Mahal which is now converted to a museum and does not look like anything that was in the earlier days though one can see the arches and the carvings on the roof that are reminiscent of a celebrated past. Then there are gardens and pavilions which would have been used by the Emperor, his wives and sons to relax during leisure times.